Healthy eating does not mean giving up your favourite foods. When you cook with good quality ingredients, avoiding processed foods as much as possible, you will feel energized, healthy and vibrant. 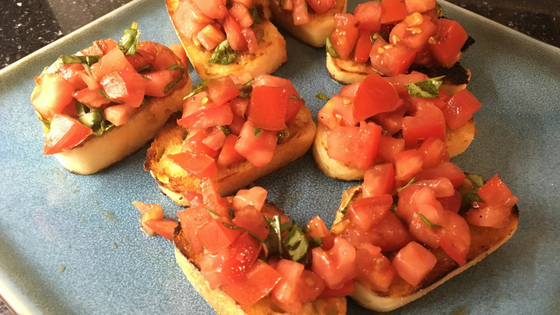 Bruschetta is one of my favourites, especially in the summer. But I do it a special way. I cook the bread in a frying pan with olive oil until it turns a golden brown. Putting the tomatoes on the hot bread explodes with flavour with the juices absorbing into the toasted bread. Warm olive oil, fresh basil, juicy tomatoes…total blissful soul food! I served it with a homemade caesar salad instead of boring old dry croutons. A deliciously light dinner that I crave over and over again. And, husband approved. Now that you are salivating, here is the recipe and a little video tutorial. Bon appetite! Double or triple the recipe if you are serving a crowd for an appetizer. Mix all together in a bowl and let sit for 30-minutes. For the baguette, cut a medium baguette into 8 medium thick slices. Heat a couple tablespoons of olive in a medium frying pan, over high heat. Once the oil is hot, place each slice of bread into the hot pan. Cook each side for approximately 2 minutes, or until golden brown. Top with tomatoes and serve immediately.